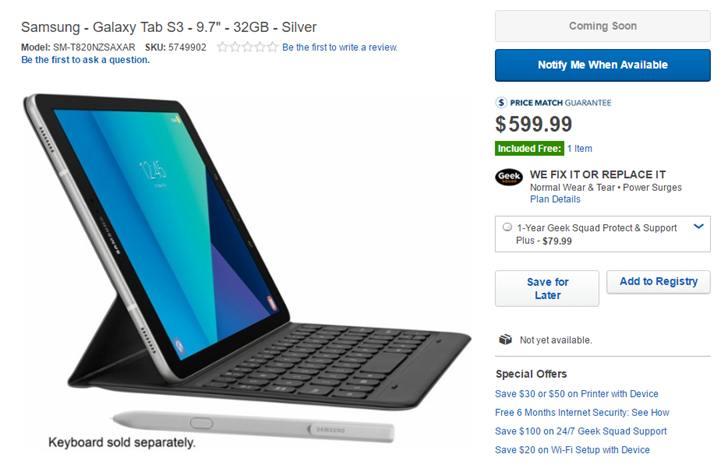 That price gets you the 32GB tablet (there are no other sizes mentioned at the moment) with the included S-Pen stylus, in either black or silver colors. Recall that this is the bigger, beefier S-Pen (which is shaped more like a full pencil than a mobile stylus, again very much like the Apple Pencil), which is the first Samsung design that's not capable of being stowed away in the tablet's body, Palm Pilot fashion. The $600 price tag is for the 32GB model - there were no other capacities announced - and carrier versions will probably be around the same with a contract or considerably more expensive without one. Best Buy is also showing off some of the Tab S3's accessories, namely a "folio" case that doubles as a kickstand and a mobile keyboard with full chicklet keys. Both attach to the tablet via strong magnets, not the physical snaps of some previous designs, and the keyboard uses POGO pins instead of Bluetooth for an easy connection. The folio case will run you a pricey $59.99, while the keyboard goes for $129.99. That's expensive, but fairly standard in the current market. CDW also has a listing for the tablet at $586.99, but the page says "call for availability," and the retailer often has prices a bit below MSRP. Best Buy is only listing the tablets and accessories as "coming soon," with no option to pre-order them as yet. Samsung hasn't given the Galaxy Tab S3 an official release date, but usually a retail listing means a release in less than a month.